The chapter starts with Joe training, he is angry and is trying to left off some steam from what happened in the match; at the same time Nanbu and Sachio are in presence of Fujimaki, the Gangster that helped Pops and JD in entering Megalonia and he is not happy for what happened in the fight. Pops tries to explain to the gang boss that what happened was a dirty trick made by Mikio, the guy detected their past and used it against them! Fujimaki says that is not pretext, and if JD can´t go to Megalonia, then… Someone will have to pay. Nanbu then says that still they aren´t done yet! They still have a plan! Back to the house, Sachio, Nanbu and Joe are seeing what they can do, JD is mad because he feels that if Pops didn´t had stopped him that one time, they would be in a different position; Pops then tells him that if Joe would have done that, they would have been truly screwed since Mikio knows about Joe´s past…Still, there is something weird since it would have been easier if Mikio or the Shirato group would have just tell to all the world about JD´s past; but instead Mikio did it in private, so maybe… There is a reason on why he wants Joe out of the competition… One that Mikio doesn´t want to be public, so if they can detect what reason is then… They might get another chance. Back in the near past, in the conversation Pops and Sachio had with Fujimaki; the gang leader reveals to the members of team Nowhere that a few weeks ago, there was someone who was sniffing around searching for bits and pieces of information of Junk Dog, so clearly they looked at that ID and found some traces that it was tampered; still… His people is professional enough, so those people weren´t able to dig all the information that exist about Junk Dog, so what Mikio did was bluffing and saying half-truths to them, obviously, after knowing that, Pops would be both surprised and angry, still nor him, Sachio or Joe are ready to give up! Fujimaki says that they will support them until the last moment; but if they can´t make it, Pops won´t be the only one who would be paying, Sachio will pay too. Fujimaki, following his promise to help them, has decided to move on, since he knows of someone who worked on Shirato group in the Gear department, that person got fired after being caught selling some parts in the underground, so now the guys is in the misery and is a frequent user on the places he owns. That person is Mizuhara Koichi, and soon enough he is brought to the presence of Fujimaki and Nanbu; Koichi reveals that the team he was part of worked on the superficial parts of the Gear, almost all of the hard work was being done by the internal teams; and that there where 2 teams working on different projects; one was working on what it seemed an AI gear and the Integrated Gear that will end up being Yuri´s Gear, still in the end the team working on the AI Gear was disbanded and the project cancelled…And that team was managed by Mikio, so it seems that there is a division between the Shirato Brothers. Meanwhile Yukiko and the rest of the board have decided to make Mikio the 4th chosen fighter for Megalonia and the announcement will be made tonight. Yuri, for his part, is training alongside his dog; suddenly the dog gets hasty and angry, Mikio has shown up, he tells Yuri that it seems he will finally be fighting him; Yuri, who is calming his dog, tells him that still he is forgetting someone; Mikio asks if it´s Burroughs The Lion? He says that he has experience defeating animals, since a Man will overcome beasts…And he already did it with that Coward Dog, Yuri, before leaving, says that he is not so sure since when an animal sinks it´s teeth it won´t let go… Specially Stray Dogs. Meanwhile Mikio is training and it looks like he is very tired while some numbers go to his Gear; back with Pops, he has a plan now… Since the enemy of his enemy is a friend, or so they say…Fujimaki then warns him that the nature of the people don´t change, and that Nanbu is still an scorpion. 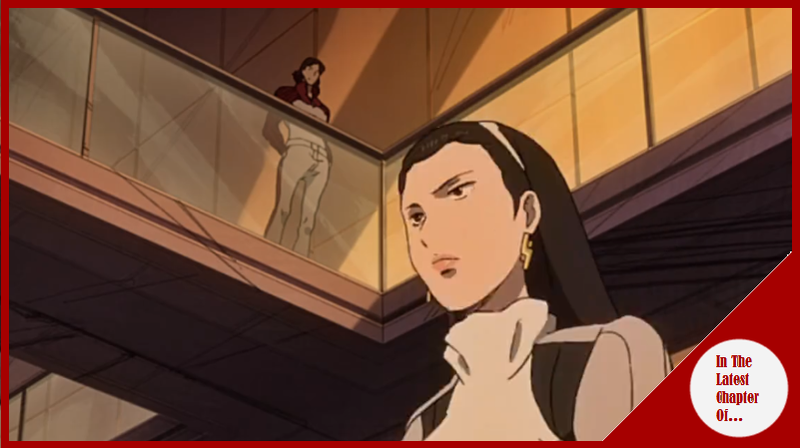 On the Shirato Building, Nanbu is explaining to Yukiko about what happened in the night of the match, still Pops holds his reserves regarding certain information regarding the nature of the element that Mikio used to blackmail them; still his words reaches deaf ears since Yukiko for starters doesn´t like nor Nanbu, nor JD and second: It´s her own brother who he is talking about so if there is not any proof or the complete truth she doesn´t have to listen to him, quickly Nanbu stops her from getting out and tells her that the nature of the accusation that Mikio made was about Joe´s past; but still he is the real deal! He is actually a good Boxer! He deserves a second chance! Those words ringed a bell on Yukiko´s mind, still… She puts Nanbu aside and locks him in the room until the ceremony is over. Nanbu then contacts with Sachio and tells him that it didn´t work out, he feels defeated and doesn´t know what to do, Joe, who over heard the situation decides to enter the action, now that the time for the Ceremony is near! Joe is running on his Bike he is aiming to storm the ceremony! Pops has done more than enough, and now it´s his turn to do something! The Ceremony is starting and Yukiko is about to present the 4th contender for Megalonia, whose stadium is already made! The promo for Mikio comes and Yukiko presents him, she is about to give him the invitation until Joe reaches! The guards try to block JD; but he succeds in reaching where Yukiko and Mikio are, Joe has come for a new match against Mikio…One to show who is the real deal! Mikio then says that he doesn´t need to fight against a coward who backed one and forfeited the first time! Suddenly a realization came to Yukiko, she now understands why her Grandfather choose her and not Mikio, because she, just like him, knows about what is the real deal…And following that, Megalonia must be filled with people who are the real article, not with people who are there without fighting! Yukiko takes the invitation and cuts it in half, one for Joe and the other for her Brother, who whisper to her that from now on he will do everything in his power to destroy her. Yukiko announces that a new match between Mikio and Joe will be made! The Winner will be the 4th contender to Megalonia! A very good chapter, I was entertained the whole thing with all of this (somewhat rushed) drama and how Joe will have his rematch! The whole thing was very quite well done and even gave us what Team Nowhere wanted without feeling farfetched, and that is something good since Yukiko Shirato is not an ally of Joe or his methods; but ultimately this move is helping her in more than one way. First: because she is avoiding her Brother to go into Megalonia and try to get in her plans; second: a little of spectacle will always help in promote this event, since all sports (especially Box and Wrestling) have some degree of spectacle to entertain the audience and the fans, and this sudden fight will do just that! In the other side, now we know more or less part of the fight inside the Shirato group, and while we are seeing that there where 2 factions making gear, I think this thing goes deeper than that! Especially with Mikio, since that scene of Mikio tired while the gear was doing something was… a sign, a sign of something with Mikio and maybe his condition; plus there is the whole military thing from the past chapter and all. Finally, man I´m hyped to what is coming! This arc they truly have nailed it on this second chapter! So this fight better deliver!